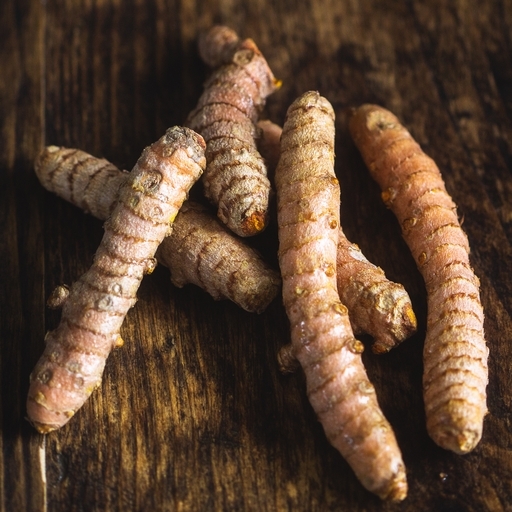 Fresh turmeric has vibrant orange flesh with an earthy, peppery, slightly citrusy flavour. It’s brighter and livelier than the whole ground stuff, and packed with goodness. This colourful root brings an exotic dimension to your cooking; use to pep up juices, soups, curries, dals and chutneys. Depending on how tender it is, you may want to scrape off the skin before use. As a rough rule of thumb, 1 inch of fresh turmeric (or 1 tablespoon freshly grated) equals 1 teaspoon ground turmeric. Chop or grate as desired, and add to curries, soups, and even juices. Keep in the fridge, or freeze.